Located on the first floor of The Lakehouse Bed and Breakfast, the beautiful Mediterranean Suite offers a direct view of Canyon Lake, making it a wonderful spot to relax during your Texas Hill Country vacation. The most requested of our accommodations, this suite is a tribute to the celebrated blue waters of the Mediterranean Sea. 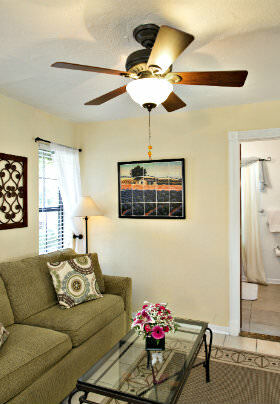 The two-room suite boasts a king-size bed and separate sitting area with a chair and sofa. 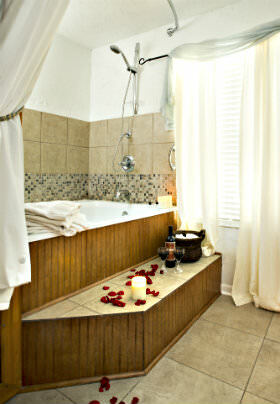 A two-person whirlpool tub invites you to soak away your worries and live in the moment. Rates from $225. Click on “Book Now” below for rates and minimum stay. What a remarkable experience! From the décor to the cuisine to the wonderful hospitality, everything was simply fabulous!